Full Convert will quickly and easily copy your data from source to the target database. It will create all the tables, copy all of your data, then create indexes and foreign keys. Our software is designed to shield you from complexity of underlying databases. While you have powerful mapping and customization features at your disposal, your data will be migrated out of the box with no customization needed. Full Convert automatically adjusts to your databases and uses optimal copying mode for each table separately to achieve the best possible throughput. Migrating from your old database? We got you covered. We support modern relational databases. We support ancient file databases. For over 30 of most popular you need absolutely no drivers – just select your database and you are good to go. Even if you use a mainframe database, we support standard (if slow) ODBC standard, so our software will be able to work with your database server. 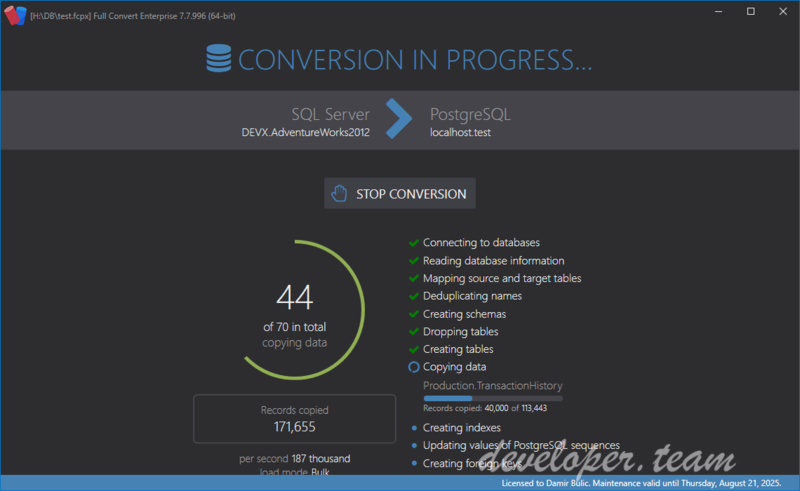 Here is an example of converting a 3 billion record SQL Server table to PostgreSQL. With a fast target database such as Postgres, we achieve a million records per second throughput! Full Convert was using just 68MB of memory, as it streams data very efficiently from source to target. Speed of your conversion will vary depending on databases you use, network lag, table structure and other factors. Having many thousands of tables in source and needing to convert just a few? No problem, as you can use our instant filtering to quicky display only certain tables. You can even toggle selection on just tables selecting your filter. Database errors can be very cryptic and it’s often hard, even for seasoned database professionals, to know what is going on – not to mention someone who is not an expert and just wants to move to another database. Our software consults our online error database when you have trouble connecting to database. We created helpful hints for stuff you may encounter. Full Convert is written in philosophy of making everything easy for the user. For example, you don’t have to manually create target database in your database manager prior to conversion. If you don’t have your target database created, Full Convert will ask you if you’d like it to create it for you. It will then proceed to copy all of your source database data into it right away. Set up schema mapping, datatype mapping and default value mapping at once for all tables. This allows you to create custom rules for everything and tweak only specifics in table mapping screens.